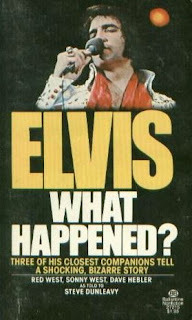 Elvis Today: Elvis: What Happened? - Do you have this? I looked at the book my colleague (let's call him L) showed me and shook my head. - No, that one I don't have, but I've been looking for a copy, I answered him. The book in his hand was the paperback edition of Elvis: What Happened? and it looked brand new. - You can have it, he said. - I got it from (here he mentioned another colleagues name, let's call her M) who's giving away some books she doesn't want anymore. She offered me this one but since I already have it I thought maybe you would like it, he continued. - You bet, I answered with a silly grin on my face as I accepted the book. I opened it and saw that it was the first edition, released in August 1977. I also noticed the former owner's signature followed by "okt .77" so apparently she'd bought it right after Elvis death. - Thank you for the Elvis book, I told M when I met her in the canteen. I explained that L had offered me the book and how happy I was for it. I guess it was pretty evident by the smile on my face. - Where did you buy it? I asked her. - Hmm, it must have been in London, but I never got around to reading it, she answered. I thanked her once again and later that day brought the book home, feeling good about it. After all, Elvis: What Happened? is an essential addition to my Elvis library. You can read an excellent review of the book here. Hello! They would know tell me where I can find this book in pdf version for download? This book has not been released here in Brazil and would love to read.